As an ESL teacher, I’ve often had parents say: We don’t speak English at home. I’m worried my child will be at a disadvantage when he goes to school next year. Should we stop speaking our native language and swap to English? The answer to this is absolutely not! Mother tongue, native language, and home language are all terms used to describe the language(s) that are spoken at home with the family. There is a widely held view that parents shouldn’t speak their mother tongue to their children if they want them to learn English quickly. Parents and teachers may be surprised to learn that developing children’s mother tongues will enable them to be more successful in English. In fact, children who come to school with a well-developed mother tongue will transfer those language skills and concepts to English. Unfortunately, if their mother tongue is underdeveloped, students are likely to have difficulties when learning in English. If both languages are developed together at the same time, what is learned in one language will transfer to the other one. This is considered balanced bilingualism. More than 150 research studies done over the past 35 years show that bilingualism has positive effects on children’s cognition1. Bilingual children need to continuously compare and contrast their two languages. This requires flexibility in thinking and results in a deeper understanding about language and how it works. There is much evidence that shows bilingual students perform better academically than their monolingual peers. Another point to consider is that many ESL parents may not have strong English skills, themselves. When they stop speaking their mother tongue and switch to English, they may be passing along poor examples of English to their children. What this all means to parents of young ESL children is this: keep up the good work you’re already doing! Continue to speak to your child in your mother tongue and work to develop their language skills in it. 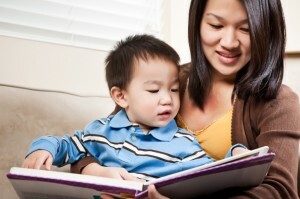 Read to and discuss stories with your child in your mother tongue. As soon as your children enter school, English will soon dominate their lives. It is very important that you discuss concepts and vocabulary your child learns at school in your mother tongue, not just in English. As anyone who’s tried to learn another language knows, it takes time! Once a child enters school, it usually takes 1 to 2 years for children to ‘catch up’ to their native English peers for basic social English. Academic English takes longer, but I will discuss that–and many other aspects of ESL teaching–in another post! FYI: There are many terms used to describe children who do not speak English at home, and they all mean the same thing!